Updated on Jan. 26 at 6:10 p.m. ET | White House Press Secretary Sean Spicer now says slapping a 20 percent tax on imports from Mexico is just one of several options on the table for paying for a wall along the southern border. Spicer says President Donald Trump has yet to make a final decision about how the U.S. will recoup the costs of his proposed border wall. Spicer had said earlier Thursday that Trump wanted to slap a 20 percent tax on all imports from Mexico and predicted the tax would generate $10 billion a year. He had told reporters on Air Force One that Trump has discussed the idea with congressional leaders and wanted to include the measure in a comprehensive tax reform package. But Trump’s chief of staff Reince Priebus said later that the administration has “a buffet of options” to pay for the wall. PHILADELPHIA — President Donald Trump called on fellow Republicans to help him enact “great and lasting change” during a party retreat Thursday but offered few details. Later his spokesman said the president will seek a 20 percent tax on Mexican imports to pay for a proposed border wall. 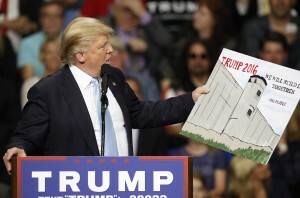 President Trump is tackling one of his election promises by ordering a border wall and cracking down on illegal immigration by stripping funding from “sanctuary cities” and ending a policy of releasing undocumented immigrants. Judy Woodruff gets views on what these moves mean from Marielena Hincapie of the National Immigration Law Center and Jessica Vaughan of the Center for Immigration Studies. Later Thursday, Trump planned to use his executive authority to continue implementing his agenda. WATCH: What do Trump’s new orders on immigration really do?